Read holiday stories from around the world. 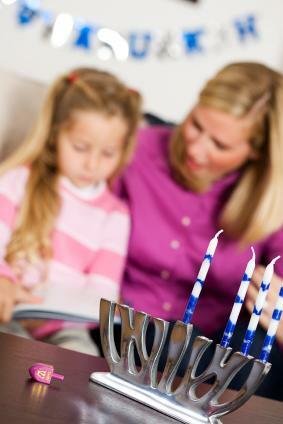 Understanding the world around them is difficult for children who are accustomed to their own holidays and traditions. Bring home some multicultural books for your child that can help him expand his knowledge of global cultures. Light The Lights! A Story About Celebrating Hanukkah And Christmas by Margaret Moorman combines the holiday traditions in young Emma's home where she enjoys both Hanukkah and Christmas traditions. Sam and the Lucky Money by Karen Chinn, Cornelius Van Wright and Ying-Hwa Hu follows the story of a Chinese American boy who is celebrating the New Year with money in his pocket that he is going to spend. Uncle Monarch And the Day of the Dead by Judy Goldman and Rene King Moreno is the story of a young Mexican girl's understanding of the meaning behind the Day of the Dead. Japanese Traditions: Rice Cakes, Cherry Blossoms and Matsuri: A Year of Seasonal Japanese Festivities by Setsu Broderick and Willamarie Moore goes through the different celebrations throughout the calendar year in Japan. At the end of the book is a short list of questions to help kids "look more closely" at the illustrations throughout the book. Fasting and Dates: A Ramadan and Eid-ul-Fitr Story by Johnny Zucker and Jan Barger Cohen follows a family as they celebrate Ramadan, a holiday in the Islamic calendar, and Eid-ul-Fitr on the day after Ramadan. Celebrations of Light by Nancy Luenn and Mark Bender is a short book chapter book that covers different festivals around the world in the month they are celebrated. Though it is divided into chapters, the short book is just 32 pages, perfect for intermediate readers who are not quite advanced enough for full chapter books. Older children will find chapter books more engaging and challenging to read. They can read them in their free time and even use nonfiction books for school projects on various cultures. Both nonfiction texts and fictionalized storybooks are good to give children for a well-rounded understanding of holidays across different cultures. Festivals Together by Sue Fitzjohn, Minda Weston and Judy Large is a 220 page book that covers a variety of holidays in different cultures, from China to the Philippines. Craft projects are also included for the various holidays in this book. Children Just Like Me: Celebrations! by Anabel Kindersley and Barnabas Kindersley is a chapter book that covers different holidays throughout the world by season, from Purim in England in the spring to Diwali in India in the winter. Zoe's Extraordinary Holiday Adventures by Cristina Minaki is a fictional story of a young girl in a wheelchair who learns about various cultural traditions as she yearns for adventure. Kids Around the World Celebrate! : The Best Feasts and Festivals from Many Lands by Lynda Jones not only covers a number of different holidays, including Carnaval in Brazil, but also includes crafts, activities and recipes for children to make on their own. How I Celebrate: A Young Person's Guide to Celebrations of the World by Pam Robson and Teri Gower is divided into chapters that explain the different calendars and celebrations, including birth and wedding celebrations, as well as special days and holy days. The Ancient Celtic Festivals: and How We Celebrate Them Today by Clare Walker Leslie and Frank E. Gerace is a chapter book that covers not only holidays, but how their Celtic origins, too. Having a good collection of holiday books will help children understand differences between themselves and their friends. Celebrate diversity and promote unity by sharing cultural traditions around the world with your children.